Case Studies in Sport Communication: You Make the Call goes beyond the box scores by offering readers the opportunity to evaluate popular and diverse issues in sport—including management, crisis, health, ethics, gender, race, and social media. Each chapter incorporates theory and communication principles as well as topical background information, and concludes with discussion questions and engaging assignments. This volume presents real-life, provocative sports cases that bring contemporary headlines into perspective and inspire critical thinking. Each chapter features scholarly evidence that will keep the conversation lively, thoughtful, and informative. 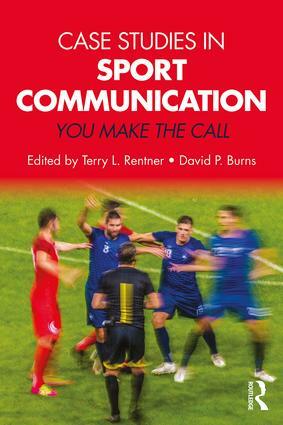 Students are encouraged to challenge the ethical implications of what they have read and to “make the call.” This is an invaluable resource for upper-level undergraduate and graduate students of sport communication and sport management. Terry L. Rentner, Ph.D., is a professor in the School of Media and Communication at Bowling Green State University (BGSU). She teaches public relations and journalism courses at the undergraduate level, including sport PR, and pedagogy, health communication, public relations, and advertising at the graduate level. She is also co-founder of the Richard Maxwell project, created to foster student participation in sport media and communication activities and events. David P. Burns, Ph.D., Associate Professor, teaches sports reporting and other advanced journalism courses in Salisbury University’s Communication Arts Department. Besides sport communication, his research interests focus on media-politics linkages that impact journalism and the communication industry. Burns serves on the editorial boards of the Journal of Middle East Media, Central European Journal of Communication, and AEJMC’s Electronic News.